I love the textures you've achieved on the fabrics and background. I like the stylishness of this, it's a really tight composition, I'm glad you put the figures at an angle, creates some nice movement. 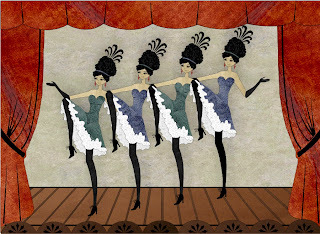 I ended up with dancers, but I didn't even think of a chorus line! Really clean and stylish but I particularly like the design of the headdresses. I thought of this too, but I could never have illustrated it so well. lots of humour in this piece, very nice work! I really like this! It's wonderful! This is so chic! I absolutely adore your colors!! this is wonderful, and beautifully done! tres chic! Your dancing girls are so cute! I love everything about them.